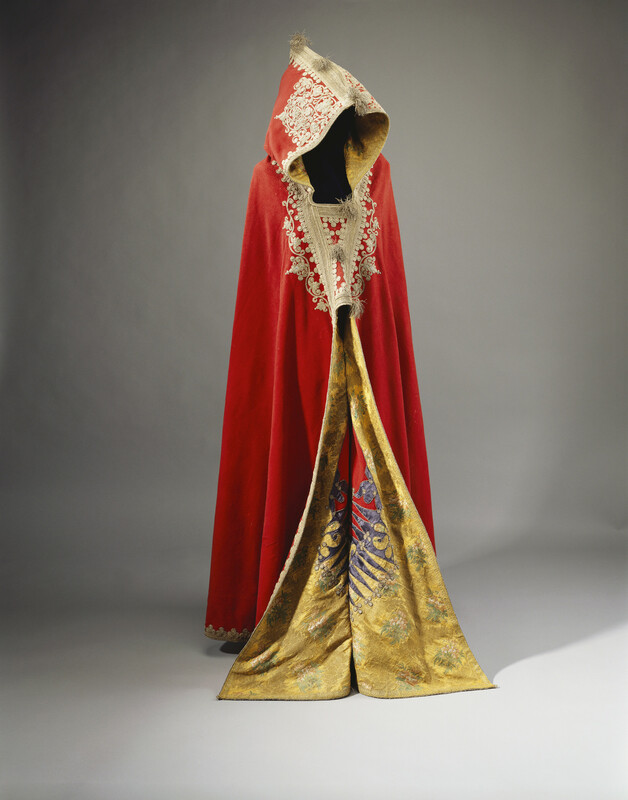 A red felt cloak or burnous with a hood; embroidered and appliqued with silver thread and braid borders of trefoils, elaborate scrolls and arabesques around the hood and breast and with tinsel tassels attached. 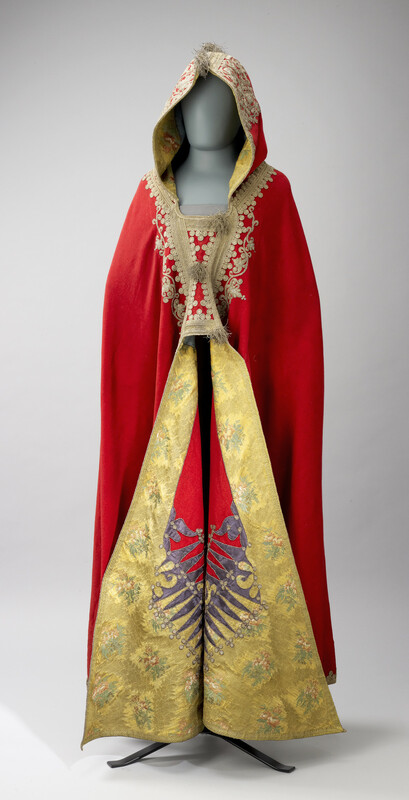 The cloak is lined with yellow silk brocade woven with pink roses and appliqued around the opening with purple silk lozenges on red felt, to represent an Imperial eagle. Contemporary biographies, and other works, including Tolstoy's War and Peace, describe Napoleon wearing a cloak of this nature during his campaigns in Egypt in the late 1790s. The design is inspired by the North African burnous, traditionally worn by Berbers, although this cloak was probably made in France. It was seized from Napoleon's baggage train at the field of Waterloo, following the defeat of the Emperor. There have been several versions of Bonaparte's escape and the capture of his carriages after the Battle of Waterloo. What is certain is that the Emperor left the battlefield on the evening of 18 June 1815 and was in Paris in the early hours of 21 June 1815. On the following day he abdicated in favour of his son, the King of Rome; this was unacceptable and a provisional government was appointed. Of the various versions of the capture of Napoleon's carriages the most reliable source is found in a statement provided for legal proceedings held in 1826 to resolve the ownership of items pillaged at the end of the battle. At the head of the Prussian advance on the fleeing French army was a battalion of fusiliers of the 15th Regiment of Infantry commanded by Major Eugen von Keller. The battalion was close to Napoleon's former headquarters of Le Caillou, close to Genappe, when the soldiers became aware of a carriage in difficulty. Von Keller recognised the carriage as belonging to the Emperor; he claimed it as his own. To ensure the advance continued Von Keller was required to promise to divide the spoils in a safe place and he ordered men from the battalion to remain close to the vehicle and bring it up to the road. Further on, towards Charleroi and close to Quatre Bras, the Prussian advance came upon the remainder of the French baggage train. Among the vehicles in this train was the 'Berlin' landau used by Napoleon for light service during his campaigns. It was taken by Lieutenant Lindenhof from Von Keller´s regiment and, so, Von Keller came to be in possession of two Imperial carriages. As a Prussian officer, his right to booty was dependent on the permission of his superior officers; in order to secure the first carriage he offered the pillaged 'Berlin' landau to Field Marshal Prince Gebhard von Blücher, retaining the first carriage for himself. The landau was presented to the Musée National de Châteaux de Malmaison by the descendants of Marshal Blücher in 1975. Von Keller sold the carriage to the showman William Bullock who put in on display in his 'Museum of Curiosities' at the Egyptian Hall in Piccadilly in January 1816. He then toured it around the West Country; en route showing it to the Royal Family at Windsor Castle. The carriage was acquired by Madame Tussaud in 1842, remaining in the Tussaud collection until it was destroyed on 18 March 1925 when a disastrous fire swept through the museum. The burnous is believed to have been amongst the Emperor's captured belongings; it was amongst those items passed to General Blücher who presented it to The Prince Regent. 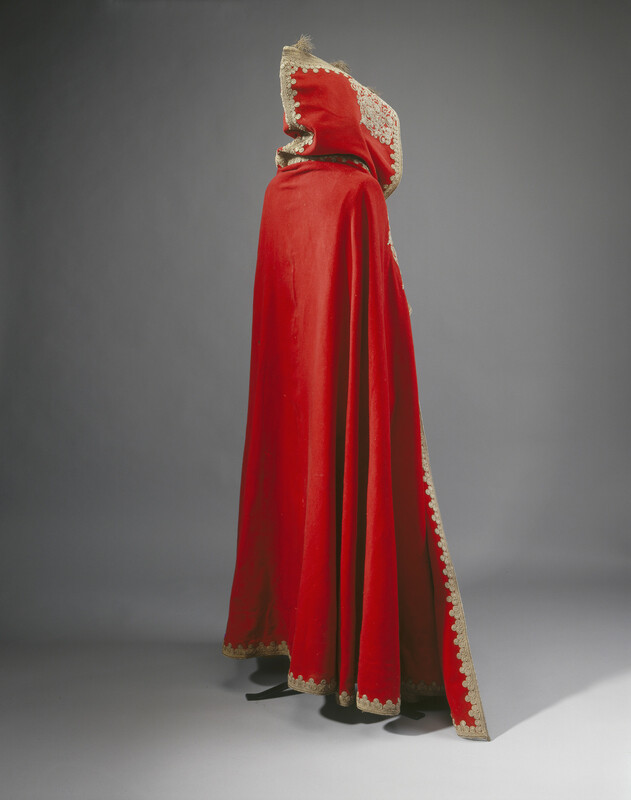 It is recorded in July 1816 in the Carlton House Inventory as 'Said to be a Cloak worn by Bonaparte' and 'A large cloak made of Scarlet Cloth with Large Hood. The Hood, The Front Embroidered with Gold. Parts of the inside of the Front of the Cloak lined with Silk Embroidered with Gold. It was transferred to Windsor Castle in March 1837. It is recorded in the North Corridor Inventory at Windsor as being a 'Cloak of Napoleon 1st said to have been brought by him from Egypt, and teken out of his Carriage by the Prussians after Waterloo. An Aide de Camp of Marshal Blücher who visited Windsor Castle about 1870 vouched for the truth of the above and said he himself took the Cloak from Napoleon's carriage'.